Iain and Matthew Pennington are the owners and chefs at award-winning restaurant, The Ethicurean, in Bristol. 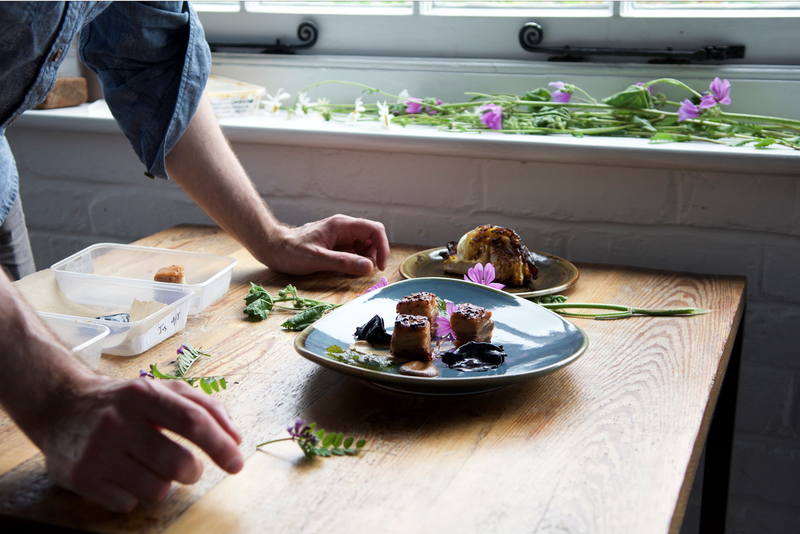 The restaurant, tucked away in a Victorian walled garden, offers views of the Mendip Hills and artisan food reflecting the brothers’ philosophy of eating seasonal, local and sustainable. 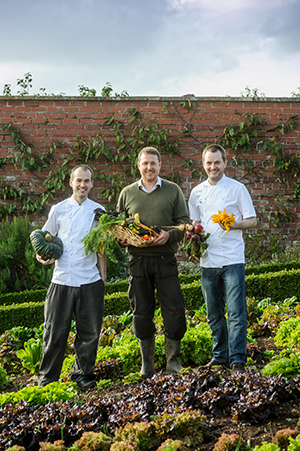 Working closely with head gardener Mark Cox, at Barley Wood Walled Garden, where the restaurant is situated, self-taught chefs Iain and Matthew source as much produce as possible from the Barley Wood plot. Food that cannot be grown in appropriate quantities is sourced from nearby. For Iain and Matthew, taking produce from farm to fork in a matter of hours, is a serious business. The radius for the majority of their food is within 20 miles. Before the evolvement of The Ethicurean, Matthew ran a chain of delicatessens. 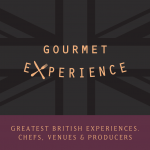 He realised the advantages of artisan British produce and started The Ethicurean, initially at farmers’ markets. On graduating from university, his brother Iain joined the business and the restaurant was launched. The brothers have learnt a lot about preservation; pickling, curing and fermenting ensure that the restaurant is functional all year around and so that food waste is kept to a minimum. The brothers’ philosophy and cooking skills and earnt them many accolades over the years including winning The Observer’s Best Ethical Restaurant in 2011 and more recently being named in The UK’s Top 100 Restaurants 2017 in The Sunday Times. An ethically conscious Modern British restaurant set in a walled garden, serving seasonal produce. The pork can be cooked overnight or the day before serving. Scatter coarse salt over the rib side of the belly and return to the fridge for 4 hours. Rinse the salt from the belly. Skin side down wrap the belly in parchment with several crushed, skin on garlic cloves and the rosemary sprigs. Wrap this parcel in foil then bake at 110°C for 12 hours. Remove any bones or cartilage, cool and press the belly between two trays with approximately 1 kilo of weight above. Allow to cool to room temperature before transferring to the fridge still under weight. The method for the celeriac and cauliflower puree is identical. Peel the celeriac and slice finely. Cook in butter in a heavy based pan, stirring regularly until caramel in colour with dark to black residue in the pan. Allow to cool slightly before scraping the pan well and adding the veg to a food processor. Blend until as smooth as possible, adding warm water when needed to ease blending. Season with salt to taste. Roll the lightly dried black garlic cloves between parchment with a little rapeseed oil and a rolling pin until flat and thin. For the fried mallow leaf, consult a foraging guide for identification of common mallow. The leaves can be shallow fried in rapeseed oil at 180°C. Cool on tissue paper. Next, heat half a pack of unsalted butter over medium low heat till the milk solids blacken and the butter turns caramel brown – this will be used for the brown butter cabbage. Pass through a fine sieve/muslin to remove the burnt solids. Allow to cool. Slice the cabbage middle into 4, brush with burnt butter then bake at 200°C for 25 to 30 minutes until golden. Finish with truffle oil and crushed toasted hazels. Portion the pork, grate panela sugar over the top and reheat in a 200oC oven for 10 minutes. 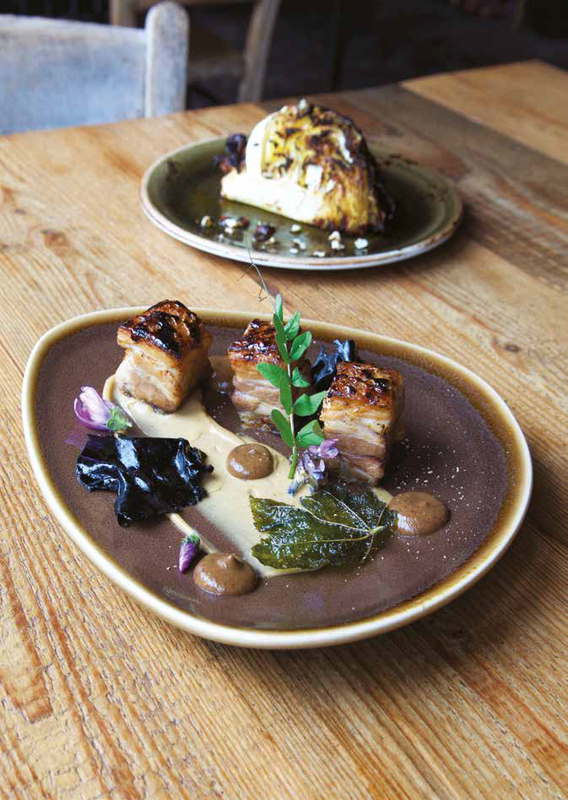 Assemble the dish with the two purees, black garlic, mallow leaf, mallow flowers and a light grating of tonka bean. Serve the brown butter cabbage on the side.